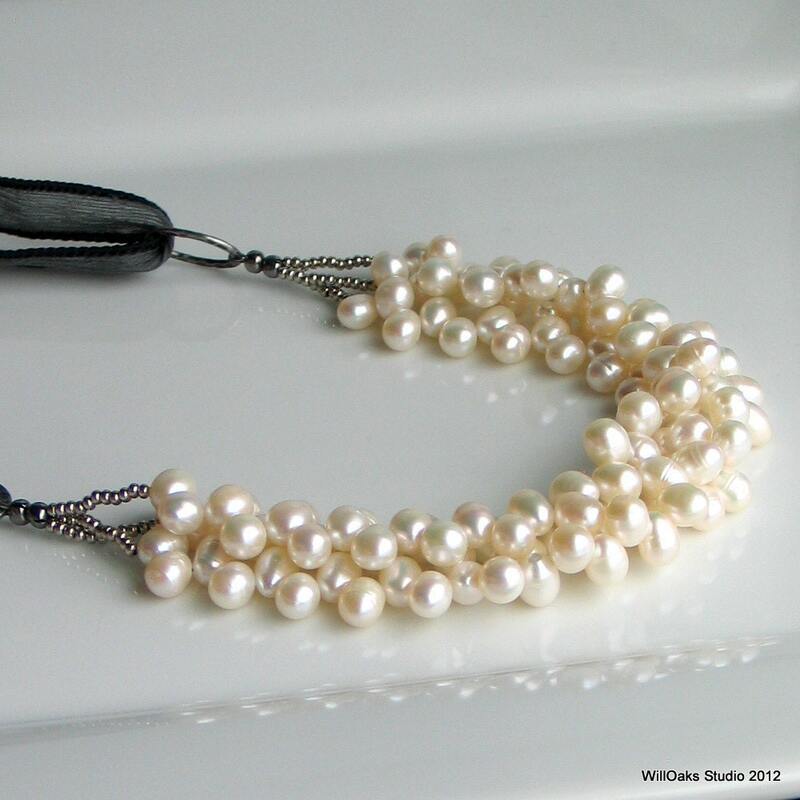 A beautiful cluster of white pearls on a silk ribbon, these larger freshwater pearls are each about 10 mm x 7 mm and a triple strand of them creates an original focal point that's about 11" long. Linked with darker silver Czech glass beads to a textured, antique finish metal oval. A handmade black silk ribbon about 40" long makes this beautiful pearl cluster adjustable in how short or long you wish to wear it. 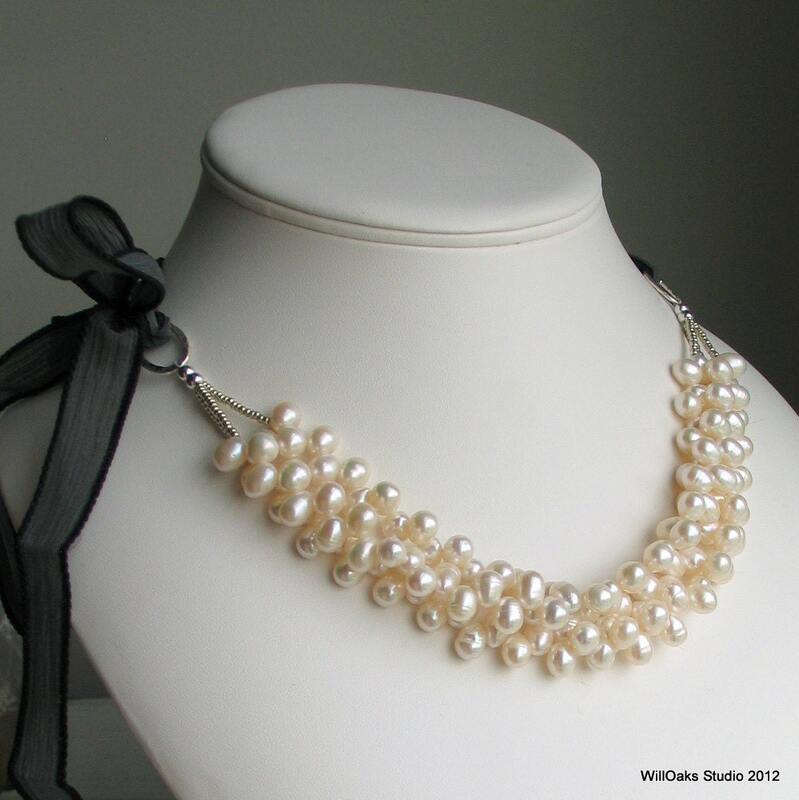 Perfect statement necklace for a bride, for prom, for formal wear, business wear and even for fun. The center front of the focal hangs down about 1 1/2". 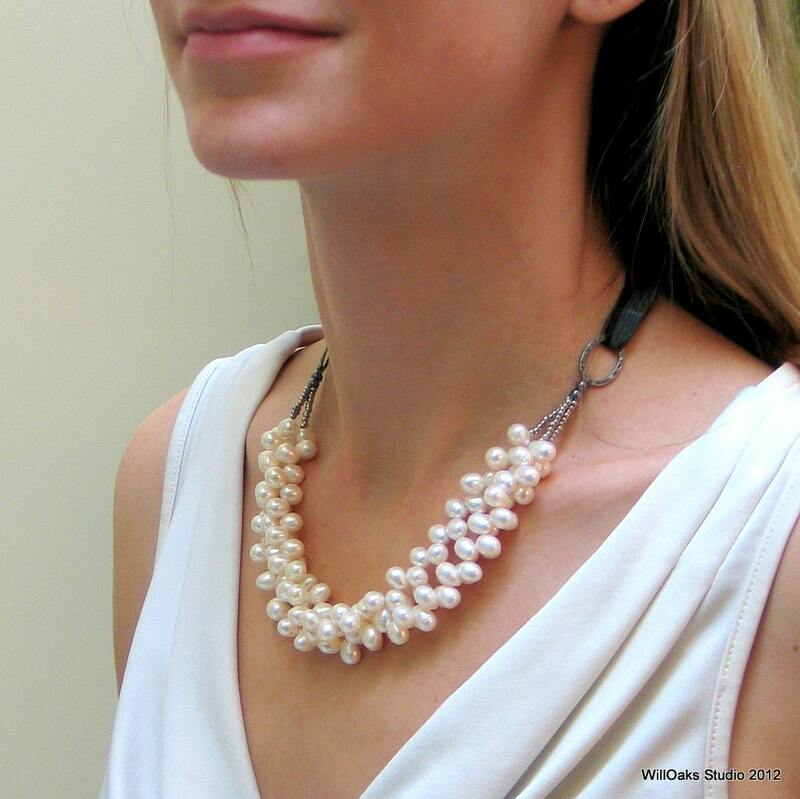 The freshwater white pearls are "rice shaped" and top drilled and have a beautiful luster. See notes below about different ways to wear this WillOaks Studio original design. I began to develop this bib design structure for pearls in 2011. 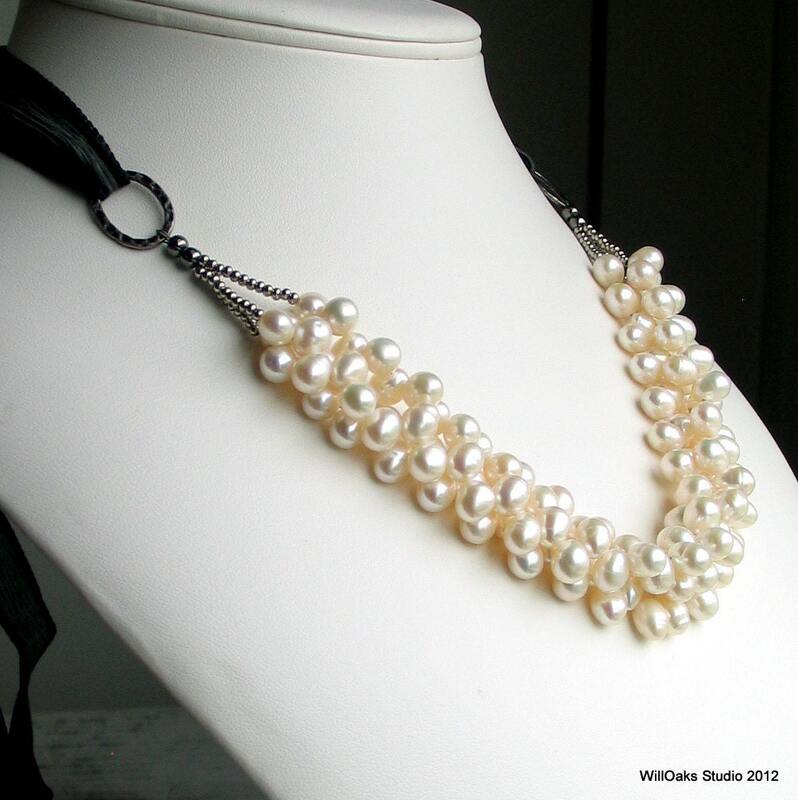 Earlier versions used silver chain, crocheted silk chain, and beaded "chains" to hold this multistrand cluster of pearls. I discovered and began to use artisan dyed handmade silk ribbons to secure them. I love this approach because the "cluster" can be beautifully worn at different lengths from a higher choker to a longer opera length. Since the handmade ribbons are around 40" long, when used double and tied in a knot or a bow, there are many different looks that can be achieved with these pieces. I have a number of different ribbon colors if black is not your preference--please contact me for more information via Etsy convo. Because pearls are a natural, variable material and dye lots will vary and I often cannot get more a particular lot. So when they are sold out, that edition is usually complete. The range of uses for these pieces is really exciting. Some examples include formal wear with a bow in the back over a sleeveless gown; with a bow tied on the side with a semi-formal top; as a kind of ascot under a blouse or button down shirt, peeking from between collar; tied long and loose over a turtleneck sweater and worn with jeans. I've been a huge fan of pearls for many years so I don't think they need to be saved just for formal wear (although they are certainly perfect worn this way!) I love them with business suits, with dresses or with a blouse and jeans. And my bib design can be adjusted to handle different necklines so has the versatility to move from the board room to the dance floor! Enjoy!! I am always hunting for new pearl colors and sizes so check back regularly! Beautiful necklace--unique yet simple. Shipped quickly. Thanks so much!